Re: Any sweet new gear? First Strike T-15. 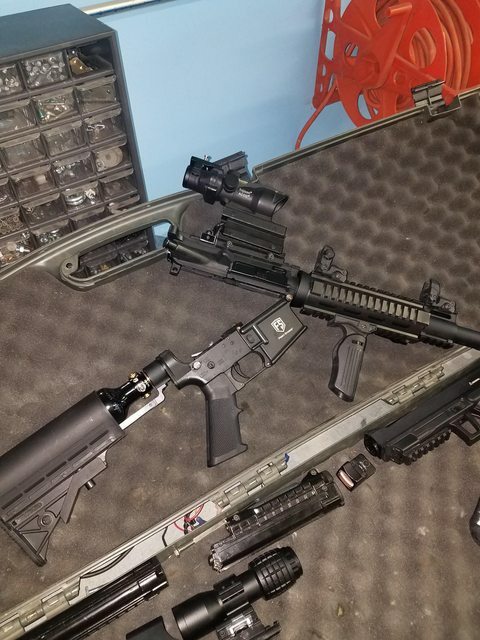 They are a 1 for 1 AR platform. 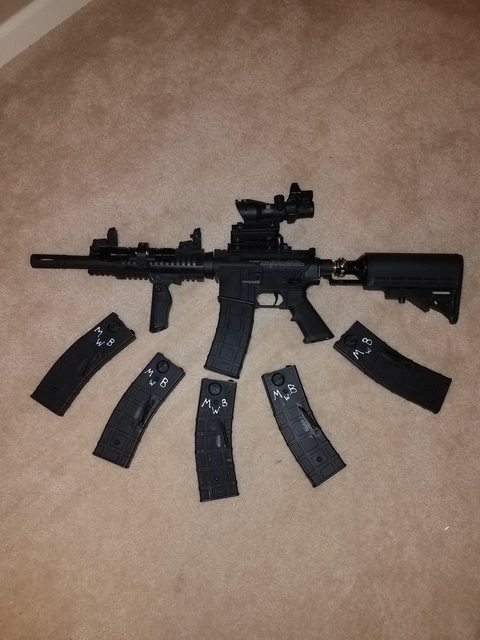 The mags are sized to an AR mag so pouches for an AR mag fit. She will also take AR accessories, so customization is out there. As you can see with the Punisher mag catch. I am still working through different optic set ups. That angled riser allows you to not have the optic complete bottomed out. Which is what I was fighting with the red dot on top of the ACOG. I need to swap that 1" riser for a half inch. But it is pretty comfortable that way. 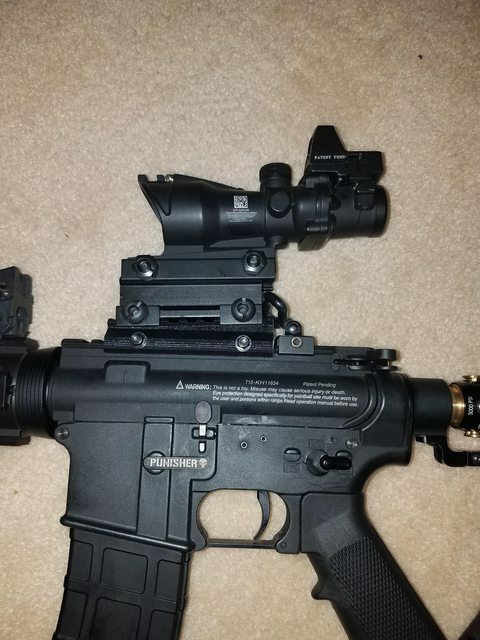 I also have an EO Tech with 4X flip to the side magnifier if I want something different. 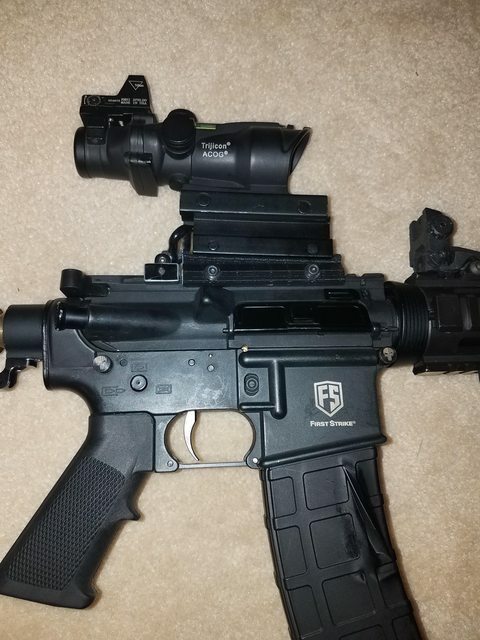 The ACOG is way easier to set up and precise though. She also breaks down just like an AR. Pushpins separate the upper and the lower and it is tool less to get the bolt out if you need to run a swab down the entire length of the upper and barrel. A little hard to see in the pic but the push pins are engraved with the Punisher logo as well. 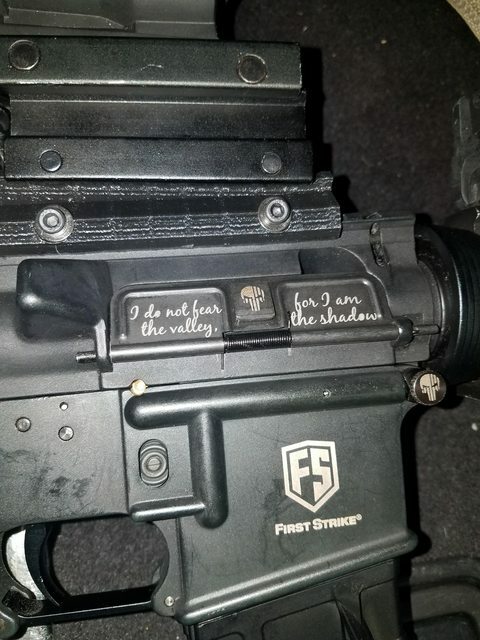 Sometime this week I have a new dust cover coming that has the Punisher logo in the center and says, "I shall not fear the valley, for I am the shadow." For those that have not seen this yet, this is why the First Strike/Tiberius mag system actually works. The Maxtact mags, that I have on my other mag-fed marker do not twist the round like the First Strike mags. 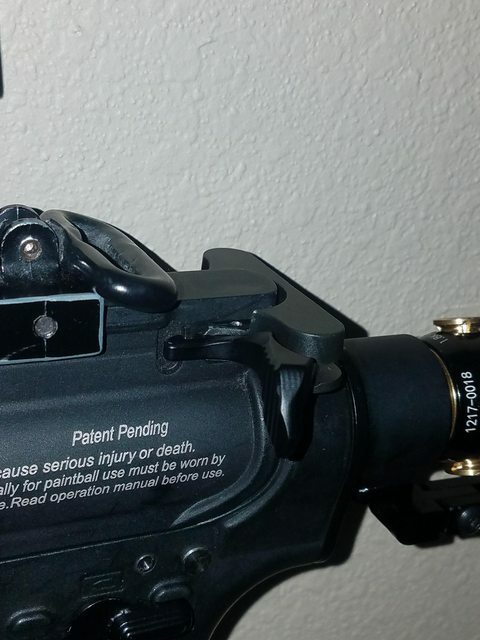 The rely on the pressure of the retention spring to force the round around the bottom of the mag. 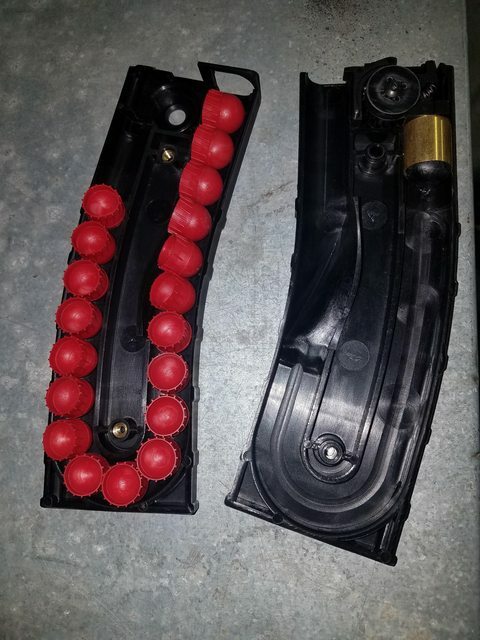 The First Strike mags spin the round so they are rolling around the bottom of the mag. Then I installed an Odinworks charging handle extension. I want to be able to rack it back with one finger. Today I got the final Punisher mod that I plan on doing for a while. Dust cover. ARdustcovers.com does make a Punisher charging handle too but that requires some fairly extensive mods to the AR charging handle to work in the T-15. Interesting setup. I can see how it would be fun, but definitely not the way I would go. It is so very fly. I am so pumped for you dude. Excited to see the impact you will have with FSR too! I should be much more accurate now that I have had time and air to dial in both optics. I hadn't dialed in either before playing Saturday. FSR is gonna be so much fun! Unfortunately no FSR anytime soon at Mad Cow. Where is Sherwood? And what are the dates? Sherwood is just on the other side of Chicago. It was earlier this year.